Sally Miller is painter par excellence, compassionate critic and inspiring teacher. Josef Woodard, writing in the Los Angeles Times, called her work serenely beautiful and timeless. Her earliest foray into teaching came when, as a seventh-grader, her teacher recognized Miller’s superior talent and, in essence, turned the class over to her. The die was cast and, for the succeeding seven decades, her life involved drawing, illustration, watercolor, acrylics and oils, and teaching. An experienced sailor, Miller’s subjects often involved a marine environment, capturing the ever-changing play of light on water. 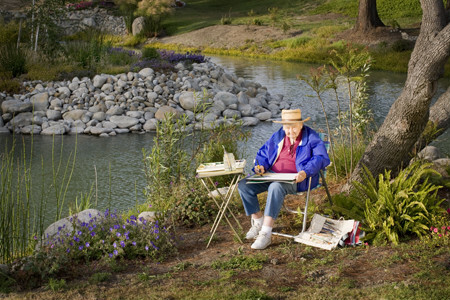 After many years of teaching in Ventura’s adult education programs, Miller organized plein air classes where her students focused on shapes and values, spaces and angles. Under her tutelage and with her encouragement, her students grew artistically and formed a mutually supportive group. Miller’s reputation as a local treasure whose influence will long be felt in the community is well-deserved. Sally Miller’s documentation took place in 2008 and was sponsored by an Anonymous FOTM Supporter. The FOTM Archive contains extensive information about this artist.